I would have to say that is an understatement as what happened this past week. On Friday it was warm and windy. Vicki and I got home just after 1:00 on Saturday morning and it was still 58 degrees. We went to bed and when I got up the temp had fallen, the wind was ridiculous and flakes of snow were falling. The wind was blowing all day and it was cold! We got some snow and even though it wasn’t all that much, it was still snow. I kept hearing about how cold it was going to be on Sunday morning and I was wondering if my old bones could move in that kind of weather. Think about it. On Friday it was windy and warm in the 70’s. On Saturday it was windy and cold in the mid to upper teens. Then there was Sunday morning. I looked at my phone when I got up and it was -3 degrees then it dropped another degree. What is going on? It’s mid Sunday afternoon and it’s 26 degrees! School teachers can tell when there is a low pressure system moving in because students are not behaving well. Some people say there is going to be a change in weather because their arthritis is acting up. Others say their bones are hurting them. Whether we want to admit it or not, weather has a big influence on our lives. As I contemplated the weather, I realized that it has impacted life for centuries. During the time of Christ weather played a part in several biblical accounts. Jesus and His disciples encountered a storm on the Sea of Galilee so strong that the disciples feared for their lives. Yet Jesus used that as a time to show them that even the winds and waves obeyed Him. (Mark 4:41) It was a hard lesson for them to learn, but they learned it. There is no doubt that the storms of life continually come against us. There are ‘storms’ that come while we are at work and others come while we are at home. There are some that strike us when we are focusing our attention in certain areas and we are ‘blind-sided.’ There are ‘storms’ that confront us head on and others slip up behind us. But there is no doubt – the ‘storms’ come. But like the two storms I mentioned, we must remember two things – God is in control of the storms and in the midst of the storms we find His providential care. We have seen how quick weather conditions can change, but we must hold to Him. We are now only days away from celebrating Christmas. We will celebrate the wonderful expression of God’s love for us found in Jesus Christ. Yet even in the midst of this joyous time, there will be ‘storms’ arise. I would pray that God will carry you through the ‘storms’ to the manger. Look again at the ‘storm’ that had taken Joseph and Mary to Bethlehem. Look at the ‘storm’ of being in a stable to give birth. Look at the ‘storm’ of being separated from their family. But remember that in the midst of the storm, God came to ‘be with us’, to be Immanuel. His love for us doesn’t diminish because of the storms. He continues to walk with us and bear us up when the temp is 75 degrees or -4 degrees. He is there whether the wind is calm or it’s howling. 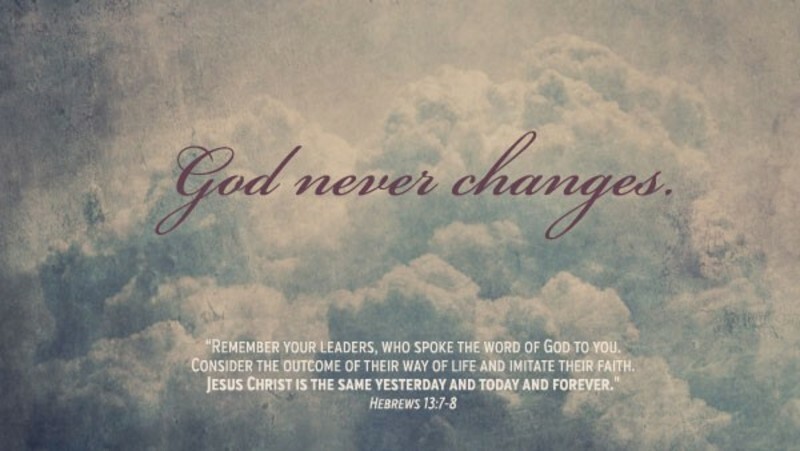 Weather changes but God doesn’t. God still controls the storms and extends His providential care toward us. As you approach this Christmas, hold to the One who loves you and came to be with you. The storms may well come, but the Master of the Wind will definitely be there for you. As you celebrate Christmas this year, I pray God’s peace will guide and guard your heart. Be blessed and have a Merry Christmas!